It may be the new year, but let’s forget about the healthy eating thing. 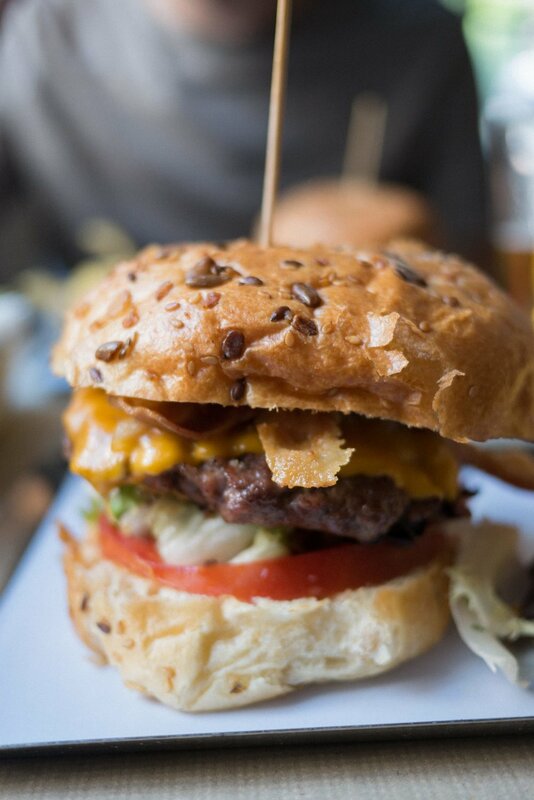 Let’s be honest, we’ll all be craving a burger in a week anyway, so here’s one to whet your appetite. Although we often plan everywhere we’re going to eat whilst away, with Naif we didn’t and quite literally fell into it (mind the step as you walk in) when we were looking for somewhere for lunch. And we’re so glad we did. For a cheap lunch we were tempted in by the offer of a burger, a starter and a beer for the bargain price of €11 and the fact that it looked really nice inside sold it to us. The decor was reminiscent of a handful of places we’ve been in Manchester’s Northern Quarter where we'd be paying almost double the price for a burger alone. We sat down and ordered our food and drink, waiting for the catch (it was just too cheap!). As the beers arrived we were even presented with a bar snack whilst we waited for our food. The starters were good, nothing to really write home about, but the burger is where this place really shone! A gorgeous seeded brioche bun with a huge juicy burger and some fresh toppings was just a delight! Perfect on a hot day in the city, washed down with a lovely Spanish beer. In fact, it was that good that we returned for a second visit and we were only staying for 3 nights so take that as our seal of approval! We're not sure if this set menu is on all year round but either way it's worth paying full price so stick it on your places to visit whilst in sunny Madrid. All imagery and content is created by us. All food and drink is consumed by us (we take that pretty seriously).